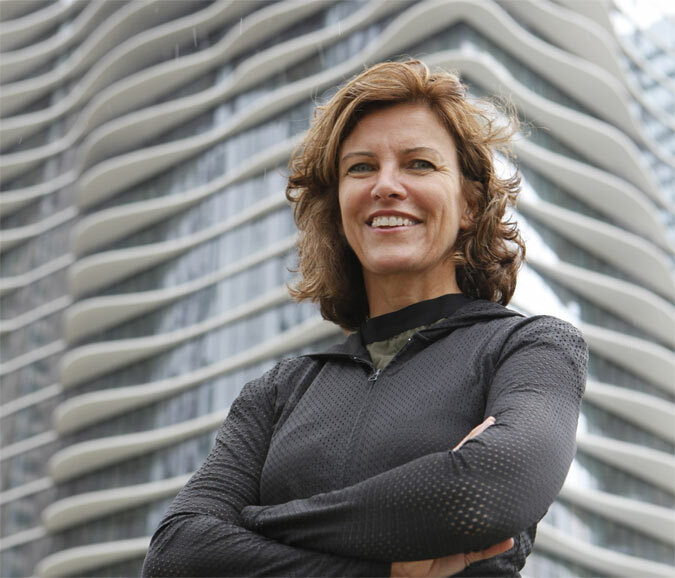 Fresh off winning a MacArthur Fellowship, last night Jeanne Gang gave a lecture at the Great Hall at Cooper-Union, organized by the Architectural League, which emphasized her firm’s commitment to material research, sustainability, and collaboration with experts from diverse fields. She spoke about an ongoing research project into possibly restoring the natural flow of the Chicago River, which may have intrigued New York’s Planning Commissioner, Amanda Burden, who was among those in the audience. The project, in many ways, mirrors the Bloomberg Administration’s citywide sustainability efforts. Amale Andraos, from Work AC, introduced Gang and guided her through some gentle questioning. Andraos praised Studio Gang’s civic engagement and the persistent “earnestness” of their work. When asked about mentors, Gang praised her unnamed professors, made a glancing reference to having worked for Rem Koolhaas, and said how much she learns from her employees. The Koolhaas connection, which she shares with Andraos, seemed particularly intriguing. Because though Koolhaas’s research intensive process certainly inform’s Gang’s approach–as it has influenced countless architectural practices around the world–Gang’s earnestness and plainspoken Midwestern attitude seems almost diametrically opposed to Rem’s persona. She also discussed her Tower of Tubes in Lexington, Kentucky, which, though it was well received in the community, has yet to secure financing. In addition she gave an preview of the firm’s contribution to MoMA’s forthcoming exhibition Foreclosed, which looks at a post-industrial site in Cicero, Illinois. And while she emphasized the importance of community engagement, she said the firm has yet to “spring” the proposal on Cicero.